CALGARY: The Canadian Constitution Foundation (CCF) responded to today’s release of the Judgment of the Alberta Court of Queen’s Bench in Boissoin v. Lund, a case which pits freedom of expression against human rights legislation. 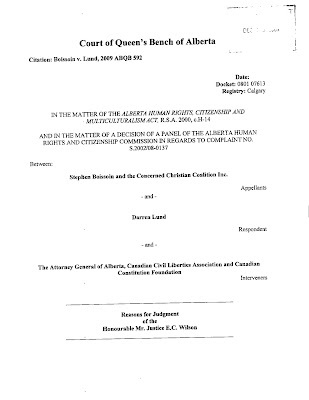 In 2008, an Alberta Human Rights Panel ordered Reverend Stephen Boissoin to pay $5,000 to University of Calgary professor Darren Lund in respect of a letter Reverend Boissoin wrote in 2002, published in the Red Deer Advocate. In his letter to the editor, Reverend Boissoin expressed his opposition to homosexuality being portrayed positively in the public school curriculum, and commented on other public policy matters. Professor Lund complained to the Alberta Human Rights Commission that the letter violated section 3(1)(b) of Alberta’s human rights legislation, which bans expression that “is likely to expose a person or a class of persons to hatred or contempt” because of race, religious beliefs, colour, and other grounds. Alberta Court of Queen’s Bench Justice E.C. Wilson set aside the Panel’s order against Reverend Boissoin, ruling that Reverend Boissoin did not violate section 3(1)(b) of the legislation. Accordingly, the Order against Reverend Boissoin, that he pay $5,000 to Professor Lund and that he refrain from making “disparaging remarks” about homosexuals, is no longer in force. “I am pleased that the Human Rights Panel Order against Reverend Boissoin has been overturned,” stated John Carpay, lawyer and Executive Director of the Canadian Constitution Foundation. “Unfortunately, the law that was used against Reverend Boissoin to subject him to expensive and stressful legal proceedings for more than seven years, is still on the books,” added Carpay. “In spite of today’s court ruling, Albertans need to continue to exercise extreme caution when speaking about public policy issues, lest they offend someone who then files a human rights complaint. No citizen is safe from being subjected to a taxpayer-funded prosecution for having spoken or written something that a fellow citizen finds offensive,” continued Carpay. The Canadian Constitution Foundation (CCF) intervened in Boissoin v. Lund to argue that the legislation itself violated Canada’s constitution, because provinces do not have the constitutional authority to restrict free speech on matters of public policy. Justice Wilson rejected this argument. Justice Wilson also held that section 3(1)(b) does not violate the Canadian Charter of Rights and Freedoms, following the Supreme Court of Canada 1990 decision in Taylor v. Canadian Human Rights Commission. DOUG CHRISTIE: What Happened to Jeff Hughes?